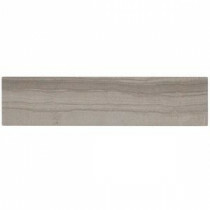 Buy online Brushed Athens Gray 2 in. x 8 in. x 8 mm Marble Mosaic Tile BRUSHED MARBLE ATHENS GRAY and leave review or share with Your friends. The Brushed Athens Gray 2 in. x 8 in. Marble Mosaic Floor and Wall Tile will provide endless design possibilities from contemporary to classic. It creates a great focal point to suit a variety of settings. Using a subway tile as a backsplash will add style and color to your kitchen decor or any decorated room in your home. It will also give it a more distinct look. The natural material will have a color variation. 0.111 square foot per piece, each piece sold individually. Piece weight equals 1.5 lb.